The Colombian government and the FARC-EP signed today in Havana a bilateral and definitive agreement on cease-fire and the cessation of hostilities, considered a key step to achieve peace in that nation, which has lived more than 50 years of armed conflict. The representatives of the Government of Colombia and the Revolutionary Armed Forces of Colombia-People's Army (FARC-EP), as well as the accompanying and guarantor countries signed the historic document. 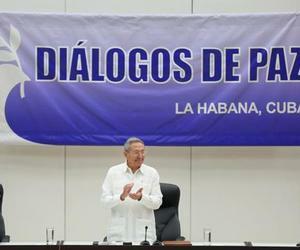 The text was handed over by Cuban President Raul Castro, President of the Cuban councils of State and Ministers, to Juan Manuel Santos, Colombia's president, and Timoleon Jimenez, commander of the FARC-EP. Also attending the signing ceremony were the heads of delegations of the guarantor countries; Bam Ki-moon, Secretary General of the United Nations, and other heads of state of Latin America and personalities. Before the signing, the guarantors of Cuba and Norway, Rodolfo Benitez and Dag Nylander, respectively, read the joint communique number 76 which also includes the agreement on the surrender of weapons, security assurances and the fight against criminal organizations responsible for killings and massacres. The text points out that both parties express their commitment to contribute to the emergence of a new work culture towards a national consensus in which all sectors commit to an exercise of the policy of democracy and civilized debate. According to the agreement, the United Nations will receive the entire armament of the FARC-EP, which will be destined to the construction of three monuments agreed between the national government and the guerrillas. After nearly four years of negotiations in Havana, this step brings closer like never before the end of the armed conflict that for more than five decades Colombia has suffered, as the parties have stressed.